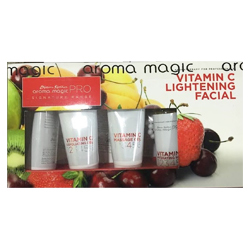 Aroma Magic Vitamin C Skin Lightening Facial - Exfoliates Deeply, Removes Tan, Lightens & Renders Shine, Hydrates, Builds Collagen. Removes tan, builds collagen, lightens and renders shine, refreshes, tones and firms. The Vitamin C Lightening Facial effectively boosts collagen synthesis and slows its degradation, especially as the amount of collagen in the skin tends to decline with age, lifestyle, free radicals and inflammation. It exfoliates the skin deeply and promotes cell regeneration so as to leave the skin with a youthful and glamorous radiance. This 6 step professional treatment takes just 50 minutes and is suited for all skin types! The Vitamin C Lightening Facial is my unique signature offering and special creation for the salon and spa industries. This facial is a 6 step professional treatment that takes just 50 minutes!. As the amount of collagen in the skin tends to decline with age, accelerated by sunlight, lifestyle, free radicals, and inflammation, topical application of Vitamin C on the skin becomes imperative. It effectively boosts collagen synthesis and slows its degradation. Use this facial once a month to exfoliate the skin deeply and promote cell regeneration so as to leave the skin brighter, replenished and rejuvenated. Being a rich antioxidant, Vitamin C also limits skin damage from free radicals and helps reduce sunburn. Apart from replenishing the skin with Vitamin C, it lightens the skin giving it a youthful and glamorous radiance. What we apply should be as natural and healing as what we eat. Clean face gently with Vitamin C Gel Cleanser for 3 minutes. Wipe off with damp cotton. Apply a layer of Vitamin C Exfoliating Gel all over face and neck avoiding the eye area, leave it on for 10 minutes. Massage the face gently with dry fingers for 3 minutes and wipe off. Massage the face for 15 minutes with Vitamin C Massage Gel and wipe off. Place damp cotton pads over the eyes and the eyebrows and a thin strip over the lips; empty the contents of the sachet in the bowl, add enough water to make a paste. Mix vigorously with a wooden spatula to get a smooth paste. Avoid formation of lumps while mixing for best results. Apply all over the face and neck. Leave on for 15 minutes to allow the mask to work its magic. Peel off the mask gently starting from the inside and wipe off with cotton pads dipped in lukewarm water. Spray Vitamin C Hydrating Spray gently all over the face and neck and leave it on.